I have had my own home for four years now and I am slowly collecting holiday decorations. A little every year. I’m not one for going all out and purchasing everything all at once. 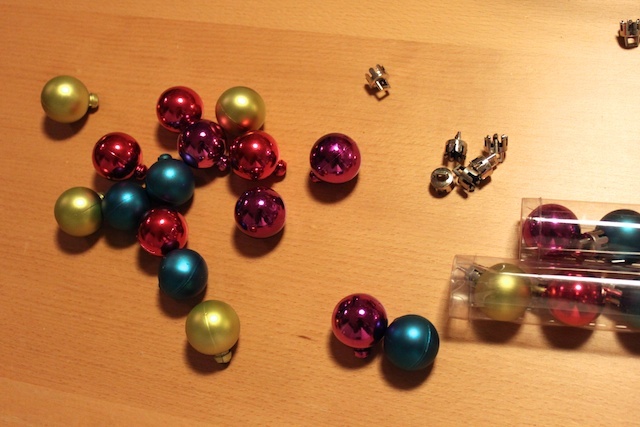 So this year, I thought of this idea to make my own Christmas tree decorations. The ornament tree turned out pretty well. It’s sitting on our mantle. It was super easy to make. And I love the colors. The only thing I would do differently next time would be to spray paint the cone a silver color. I thought the ornaments would be closer together. But because of their size and the size of the cone, it didn’t work out exactly they way I had pictured in my head. If you make something inspired by Simply Modern Mom, please upload pictures of it to our Flickr group to show it off to everyone. You may be featured on Simply Modern Mom. 1. If you want to spray paint the cone, that would be the first thing you do. Allow to completely dry before you start to glue things onto it. 2. I found these mini ornaments in Target’s dollar section. It was awesome because for a large size cone, I ended up using 10 packages with 16 bulbs in each package. Yeah, that many. 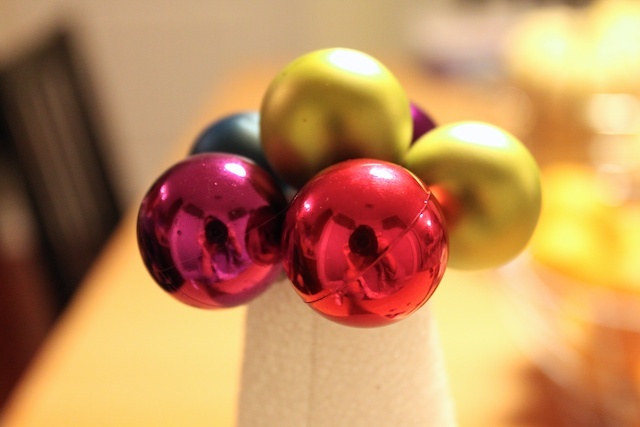 Take off the tops of the ornaments. 3. Start from the top and go down. 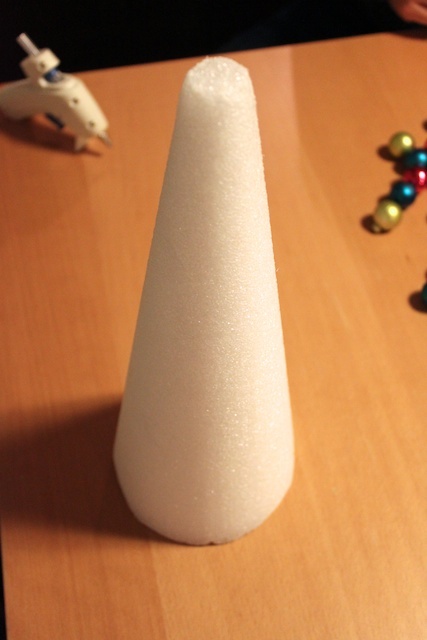 I poked the tops of the ornaments into the cone, making a hole in the styrofoam. Made sure that’s where I wanted to put it. Then I pulled the ornament out, put glue using the glue gun around the part that stuck in and put it back. 4. Start working your way down going one row at a time. 5. 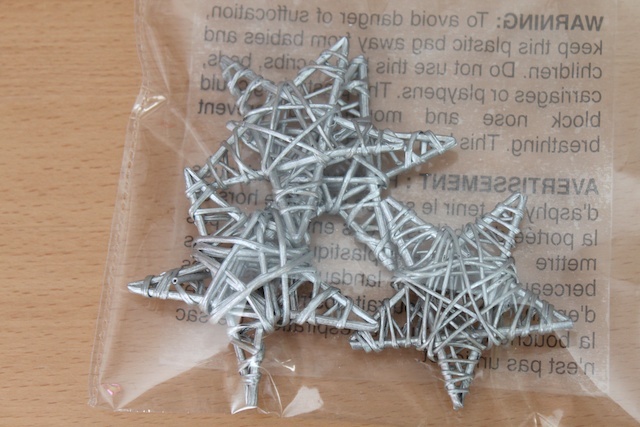 I found these wooden stars at Michael’s. They were the perfect size. 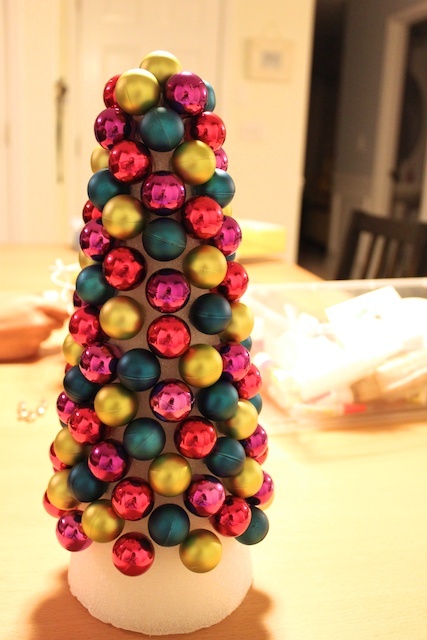 I glued one at the very top of the tree. And done! 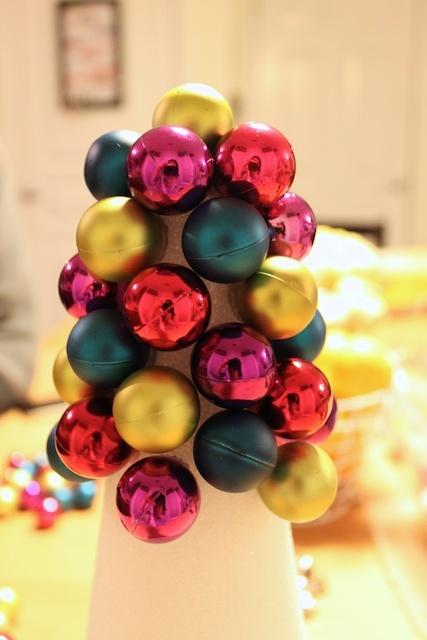 » Tell me… What homemade Christmas decoration did you make this year? I made a wreath using a styrofoam wreath base, muffin cases and a hot glue gun. I need to get some glitter spray and hang it up then I’ll hopefully get round to posting it before Christmas! I love the colors! I can see what you mean about spray painting the base. It’s not too late to glue some thing else in the gaps. It’s really cute, I’d like to make one. I love this! I’m going to make it this weekend. I’ll send you the pic! Thanks for the great idea! I added my picture of the Christmas Tree I made. I guess my styrofoam tree was too big because I ran out of balls. I used the same as you, 10 packs of 16. I searched about 7 Targets for some more and couldn’t find them. So, I had my husband chop off part of the bottom and I added Christmas ribbon at the bottom as a base. I also added red bows as a decoration to the tree. This was a great project! Thanks for the idea!! 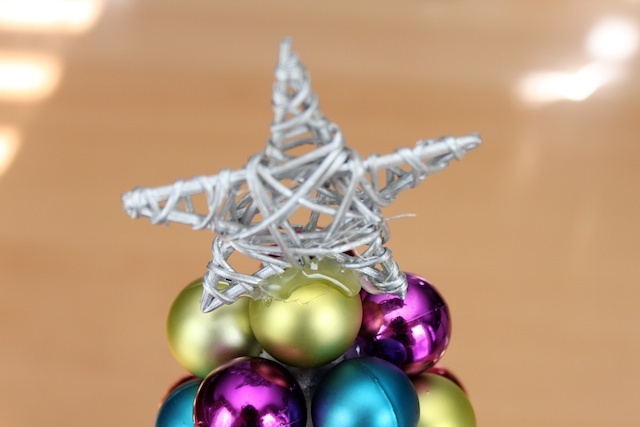 You could try pushing some bits of silver tinsel (or whatever colour you like) in between the balls to cover the white styrofoam. Did you end up trying anything to disguise the white underneath? I’m going to send this onto a friend who attempted to stick lollipops into a cellophane tree (though it took lots of wiring). I think the styrofoam idea is way-easier. She could replace some of the ornament balls with the round lollipops. Great idea and inspiration- thanks. 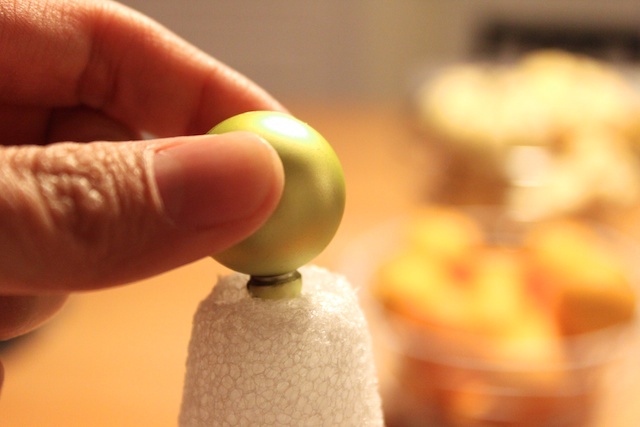 You could wrap the styrofoam cone in either ribbon or tinsel before putting on the ornaments like you do when making an ornament wreath with a styrofoam ring. You can also stick small branches of pine in between the balls then it would also have the pine smell! That is a wonderful idea. I think I might attempt this myself. I love how it looks and seems pretty easy to do. Thanks for sharing. This would be great for a dorm room! Since christmas lights are usually banned due to fire hazards! I’m getting ready to make this tree as a gift. What size styrofoam cone did you use? it’s a large size from the craft stores. I also make trees like yours. 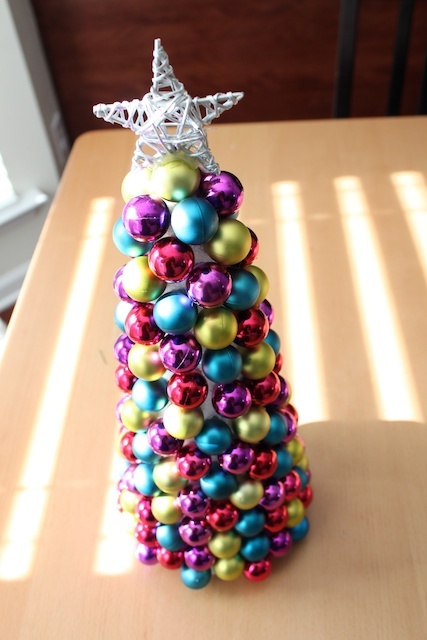 Rather than spray paint the Styrofoam cone, I weave garland throughout the balls. The spray paint melts the Styrofoam (I’ve tried it). how can you do this with out the cone? 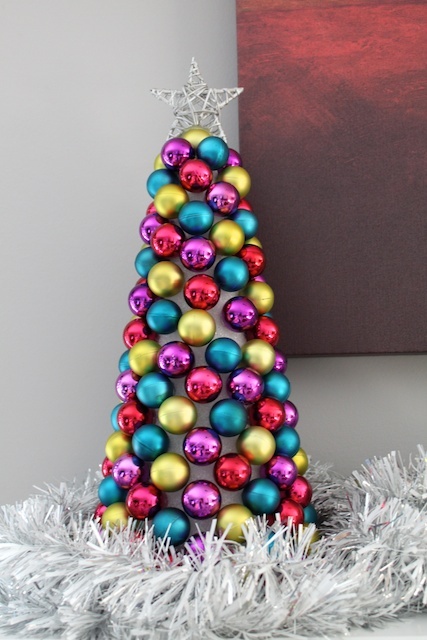 So easy and simple steps are provided to make christmas tree. specially these balls are looking so nice. I will try to make the same tree. Nice article. thanks for sharing.